What a treat! Everyone knows it’s a celebration when you are served strawberries dipped in chocolate! Learning how to make them isn’t difficult but may take a bit of practice figuring out how to dip and not drop the strawberries in the melted chocolate! Buy medium size berries – two bites is the prefect size. As beautiful as those giant ones are, they are too hard to eat! …and then spread them out on a clean dish towel to dry. Let them dry completely before you start dipping. Not a drop of water should be left on the berries. 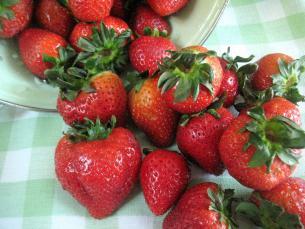 Eight ounces of chocolate will cover about 12-14 medium-large strawberries. You can use any type of chocolate you prefer – dark, milk, semi-sweet or white chocolate. When melting chocolate chips, they will not really change shape that much until you give it a stir. The goal is to slowly melt the chocolate, not bring it to a boil. If it still isn’t melted, continue melting in 15 second increments in the microwave. Stir the chocolate. It should be smooth and have no lumps. Once the chocolate is melted, start dipping. Try to cover about 2/3 of the strawberry with chocolate. It looks prettier than covering the entire strawberry. Then gently dip the strawberry into one of your additional toppings. When you do the dipping, be sure to hold back the green top so that it does not get covered in chocolate. If you are having difficulty holding the strawberry, skewer it, just under the green bit, with a toothpick. Put the dipped berries on some wax paper to set. They should be stored in the refrigerator, and eaten at room temperature, within 24 hours. Kathy, this looks like so much fun! It reminds me of decorating sugar cookies at Christmas as a kid. I doubt I’d bother to go through the fuss of tempering the chocolate first, either. If someone made chocolate-covered strawberries for me, I have to admit I’d be pretty darn impressed! Any chocolate will do, just pick your favorite! I made these last night for my husband for Valentines Day, and they turned out GREAT! Thanks for the recipe and directions!! Thanks Marlena! I did too and they were a huge hit! I don’t know if i missed something but what was the white base for the dip? cooking chocolate (in block) can be used for this recipe. Sharon, Sheveta is right – you can use white or dark chocolate. The block of white chocolate tastes much better than using white “chocolate” chips which are not actually chocolate! These look delicious! I’m getting married soon and would like to give something like these as wedding favors, but your instructions mentioned that they should be eaten in 24 hours, can you suggest something just as good but would last a bit longer? Thanks! Chocolate dipped strawberries are not really the best wedding favor if you are planning to make them yourself as they will not keep more than a day. Any dried fruit dipped, particularly apricots, in chocolate would last longer than fresh strawberries. I just tried salted pecans dipped in white chocolate and they were fabulous. Chocolate bark, wrapped in cellophane bags and tied with ribbon might be another option. When I dip strawberries in chocolate may I leave them out after being diped for 24hr. Or miss I put them in ref. Asap. YES they do need to be stored in the refrigerator. I would i like to know if the chocolate on the strawberry would be destroyed if I placed the dipped strawberry onto the wax paper? Not at all! Once the chocolate coating has hardened, the berries will peel off the paper. Can you freeze the dipped strawberries? No, unfortunately these dipped strawberries can not be frozen. mostly a question. when i’ve dipped strawberries before. after an hour or so of being at room temp the berries start to ooze some of its juice. what causes this and how can i prevent it. also, why does the fruit begin to look bad after dipping? is it the heat from melting the chocolate? Missy, it is REALLY important that your strawberries be totally dry before dipping. 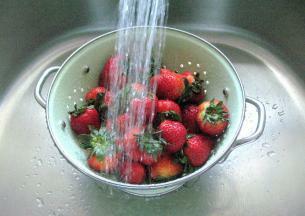 Even the slightest bit of water left on the berries after washing can cause all sorts of problems.